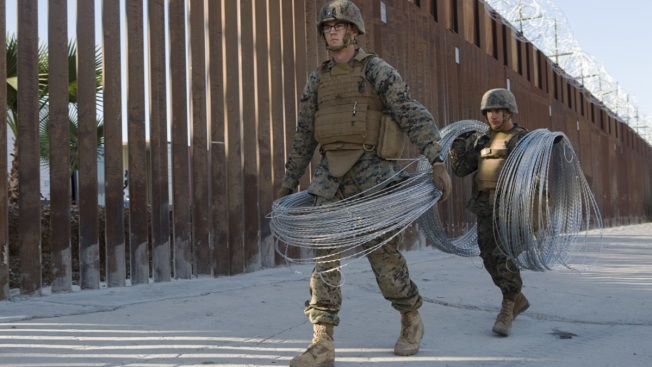 U.S. Marines with 7th Engineer Support Battalion, Special Purpose Marine Air-Ground Task Force 7, carry concertina wire to their worksite near the California-Mexico border at the Otay Mesa Port of Entry in California, Nov. 20, 2018. U.S. Northern Command is providing military support to the Department of Homeland Security and U.S. Customs and Border Protection to secure the Southern border of the United States. The U.S. this week will begin withdrawing many of the active duty troops sent to the border with Mexico by President Donald Trump just before the midterm election in response to a caravan of Central American migrants, U.S. officials said Monday. About 2,200 of the active duty troops will be pulled out before the holidays, the officials said, shrinking an unusual domestic deployment that was viewed by critics as a political stunt and a waste of military resources. That will leave about 3,000 active duty troops in Texas, Arizona and California, mainly comprised of military police and helicopter transport crews who are assisting border patrol agents. There also will still be about 2,300 members of the National Guard who were sent to the border region as part of a separate deployment that started in April. The active duty troops, numbering about 5,200 as of Monday, were initially scheduled to stay until Dec. 15. Late last month, Defense Secretary Jim Mattis extended the mission to the end of January at the request of the Department of Homeland Security. 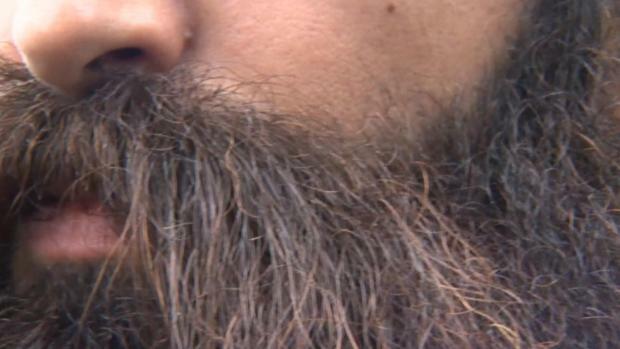 It's unclear if it will be extended again. The U.S. forces have installed vast amounts of razor wire and provided transportation and protection for the Border Patrol. The troops are not there to directly deal with the Central American migrants, many of whom eventually made their way to Tijuana, just south of California. One of the officials said that some of the military police and helicopter crews will stay in the border region so they can quickly respond if they are needed by border agents. The officials spoke on condition of anonymity to discuss internal plans not yet made public. Active duty troops began arriving at the border in early November for an initial 45-day deployment, in response to the caravan, which at one point numbered about 7,000 people, including many families with children. On Monday, Col. Rob Manning said there are currently 2,200 active duty troops in Texas; 1,350 in Arizona; and 1,650 in California. "Some units have completed their mission and they have already started to partially redeploy. Other units have been identified to rotate home and will be returning home over the next several weeks," Manning said. He declined to say how low the number of troops will go in coming weeks or provide details on any changes. He added, "the numbers of troops that we have will be commensurate with the support" that Homeland Security and Customs and Border Protection request. Headquarters forces for U.S. Army North will remain in Texas, and the troops in California and Arizona include engineers, military police, logisticians, aviation personnel and medical personnel. The bulk of the active duty troops in California are Marines based at Camp Pendleton, near San Diego, so many can easily move back and forth from the border to their home base. A report to Congress last month estimated the cost of the military deployment to the border at $210 million, including $72 million for the active-duty troops and $138 million so far for the National Guard forces. The Guard troops have been performing their separate border mission since April. There have been no updated estimates released.